I do have quite a bit of room around the CPU socket. I'm not using the first memory slot either. Unfortunately I can't measure exactly how much space I have. 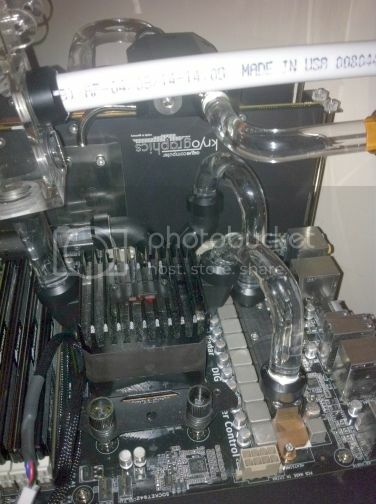 Plus the heat sinks are gone and have been replaced with small low profile water blocks. Does it look like enough room to you? I'm not even sure that 94mm will fit on my socket 1150. Mosfet heatsinks are pretty close to socket on my motherboard, should just be enough room but can't be 100% until I measure it. Will do when I rebuild my loop this weekend. I was actually having more success by reducing the length of the slots by 1mm or 2mm to increase the restriction to improve the velocity through the slots, but I had 0.5mm slots, yours are finer than that I believe. I was just shortening them to tune the flow across the block, not relevant to your setup. Also I was only shortening them under the inlet/outlet port area, still had full coverage of TEC + a few mm extra on all sides. Curious about the bowing though, how thick is the hot plate? Yes Cypres was putting 100-200w from CPU and 400-600w from TEC I believe, his best results came from TEC at 400w but I think he had other factors influencing the result, so I think your block can handle higher loads but ideally you don't want to be pushing that much wattage. 400w total heatload would be good. 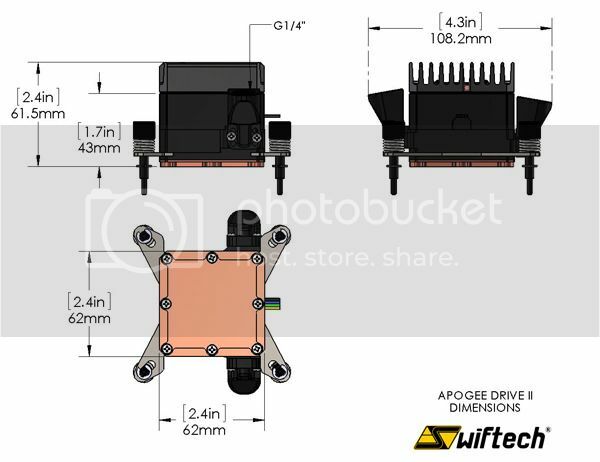 If increasing the length to 94mm would allow you to incorporate some AMD mounts that would be great for all the FX users out there. Or just make your own 1150>AM3+ adaptor bracket that you know is compatible for users who need it. ah i see, sounds good. Come to think of it I have a 6" deep jaw dial caliper at work. I'll bring it home on Monday and get a measurement. Edit: I was just looking at your waterblock and comparing it to the swiftech block that I have. The fact that the block that I have fits my board, and it is designed for the Intel socket tells me that your block will fit my board. Here's some pics for reference. I don't have memory in the first slot anymore and from what I can see, your block will clear the caps if needed on the vreg side. I think I'm good to go. 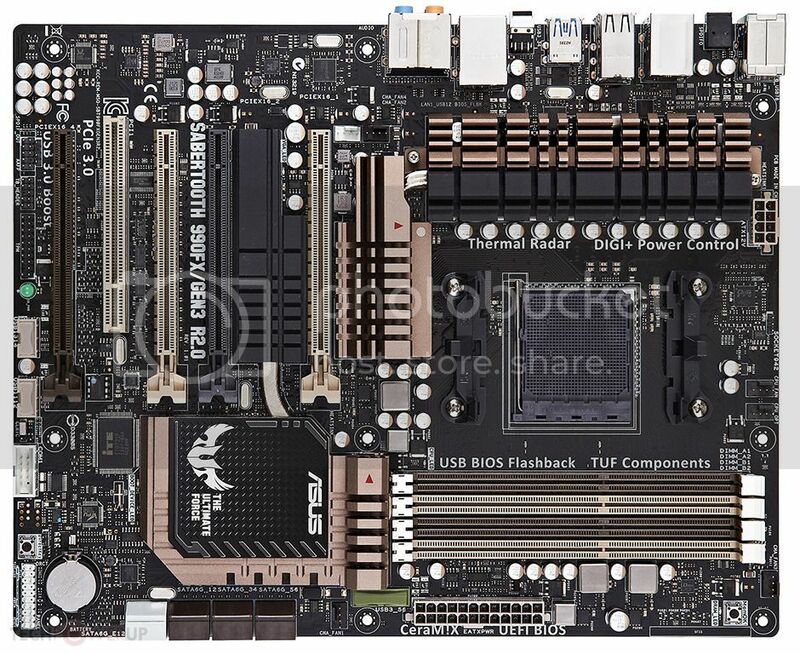 It looks like the block will clear the cap and mem socket. So I would need room between the chokes and second mem socket. Plus I will need some room for insulation. Is there any Intel boards with that kind of space? Seems like going that much bigger will make the size very prohibitive for most people. What kind of heat dump increase is the larger size going to net? So I was able to get measurements with my standard dial caliper. There is 94mm between the caps and memory socket. The caps height is 8mm and the mem socket is 5mm. It looks like the stepped blocks sides will allow room for insulation. do you think you could include a second cold plate to make it possible to stack a couple of TEC's with this block? 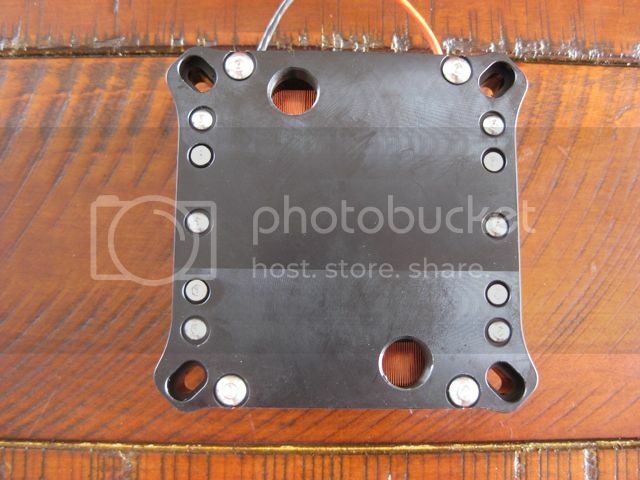 If you could include an additional 62x62x6mm cold plate (plus whatever extra material size you need for mounting) so that we could stack 2 TEC's under the block that would be awesome. I'm thinking this 669w Thermonamic TEC may not get us the delta to do your block justice, so I'm thinking of stacking the 511w 31.8v 25.2a TEC http://www.thermonamic.com/TEHC1-24127-English.pdf under the 669w TEC to give us a greater total delta. total heat load from the 2 TEC's is about 370w (130w + 240w with both TEC's at 12v) and can handle about 165w heatload from CPU for theoretical total dT of 40*c, so may actually achieve 25-30*c dT total. heat load from the whole lot is therefore about 535w, your block should be able to handle that provided we have enough radiator space.